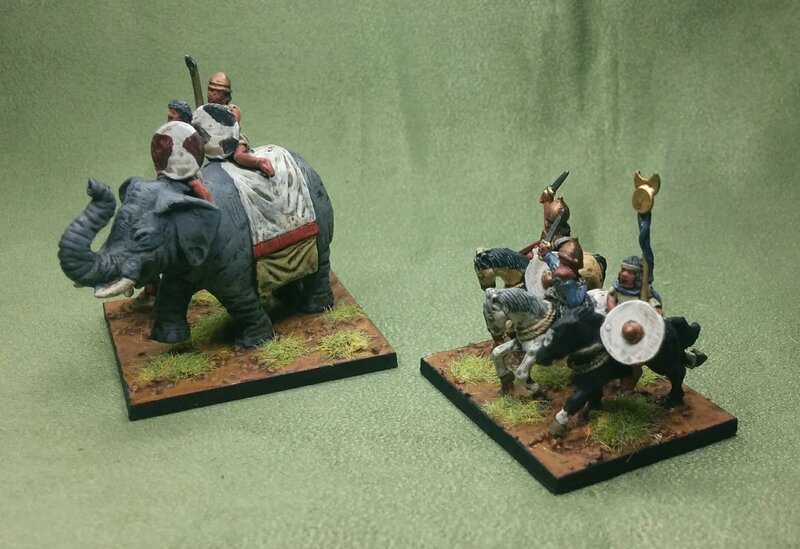 I’ve got quite a few figures started, but got a few elements finished over the weekend; one of them is some Libyan cavalry for the Later Carthaginians. These aren’t strictly necessary, but they seemed to have a bit more character than the staid Liby-Phoenicians. They’re certainly hairier! I also painted an element of Libyan skirmishers. This gives me three elements for using in BBDBA; again it’s not really necessary, but they’re nice figures. And here they are with their more established compatriots (there are a few more consorting with elephants). Now I need to finish my Syrians, and the nine elements of Veteran Libyan and Liby-Phoenician Spearmen. They’re all started. Despite plans to start a regular evening DBA meeting this year, it’s yet to happen, but I have caught up with Nick for a number of enjoyable games. 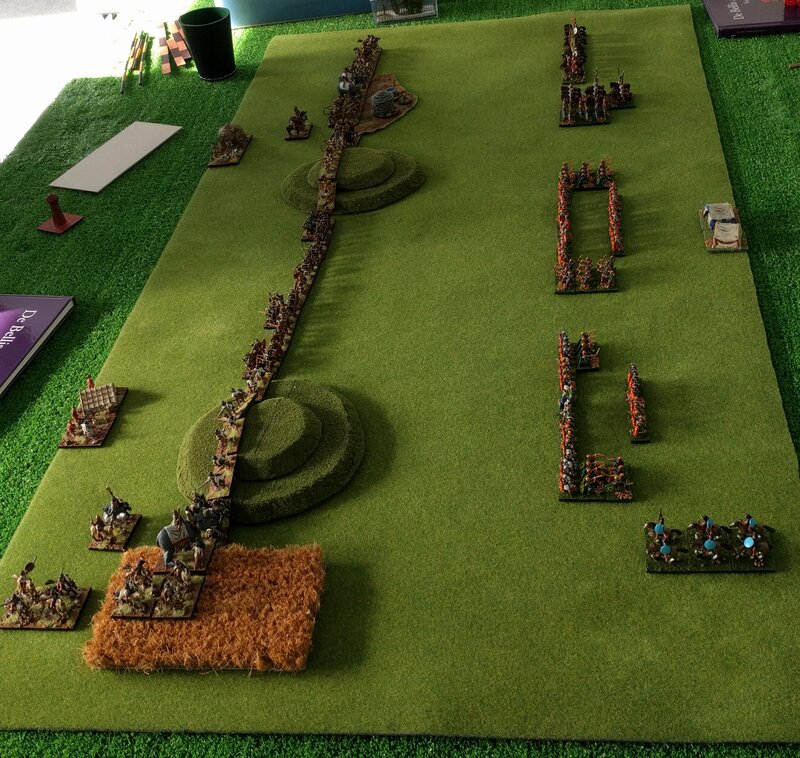 One back in January saw a BBDBA contest in which my Marian Romans with Numidian allies were defeated by Nick’s Romans. We didn’t take any photos. I think my Numidians forgot to be defensive and were defeated before I could win elsewhere. A fortnight ago we had a couple games using some of my newer armies. My Numidians defeated Nick’s Marian Romans. 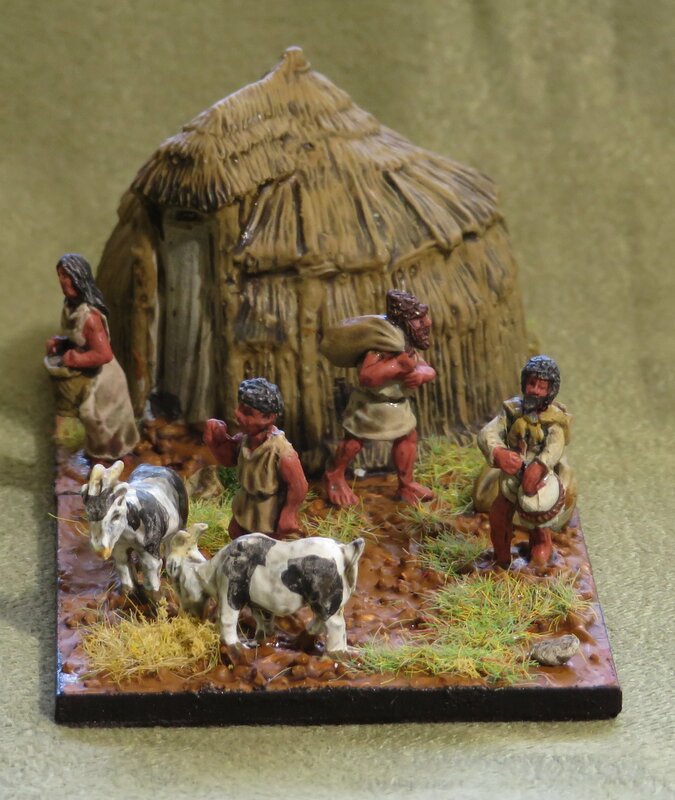 The Numidians face Roman interlopers in a very green season in Numidia. I rushed forward to trap the legionaries next to the woods. I didn’t succeed, and I had the auxilia on my left that I didn’t want to meet with psiloi. From memory I was on the verge of defeat when I was lucky enough to create a hole in the line of the blade (I’d been falling back; I’d lost my only psiloi on the right and my commander was trying to retreat over the hill). This brought me back into the fight, which was looking over for the Numidians. I had been saved by good PIPs that allowed me to retire the general while keep pressure on in the centre. I was lucky to win. The next battle was between my Campanians and an Italiot Hoplite army. It was fought on a battlefield with no Bad Going, but only a boggy and a scrubby patch, both Rough Going. My Hoplites created a breakthough in the centre, but I was so obsessed with winning on the flanks I didn’t exploit it. Instead, when I rolled 1 PIP I chose to take a risk with my general facing enemy cavalry so that I could develop an advantage on my right flank. This cost me the game, as my General was 6-1ed and destroyed. The Italiots managed a close victory. Last weekend we caught up again. I got the Marians and Numidians out for a BBDBA game. Nick fielded his Early Imperial Romans. This game was interesting, as my centre destroyed his in record time and my Numidians were able to break their opponent with this support. I’ve not seen blade go down to blade so fast before. My dice were very good. the element that did it was a ring in. To get the 10 elements of legionaries I needed I used an element with different shield patterns. 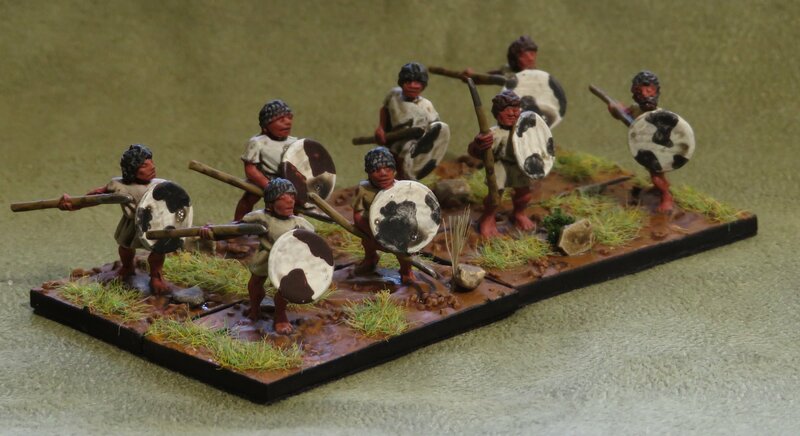 These are an element for my Mithridatic army, one I’ve described as Marian exiles fighting for Mithridates. Clearly they are dedicated defenders of the Republic. The game was nearly over before the left wing made contact. 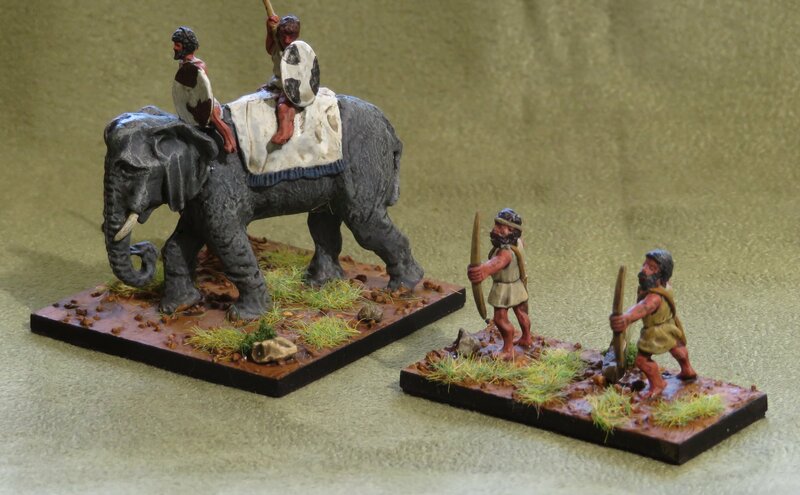 My elephants were still stuck in rough going (my new hamlet), and I was nervous of the Roman knights. The righteous defenders of the free Republic face off on hills against the supporters of the tyrant Augustus. The EIR wing on my left, cavalry, knights and auxilia. The EIR centre, auxilia, blade and bow. The EIR wing on my right, blade, auxilia and rogue Numidian LH. The battle from the side; the centre led by Cato is between two difficult hills; Juba’s Numidian psiloi are on one hill while his imitation legionaries, elephant and cavalry are in rough going; Labianus on the right wing is in a hamlet with elephants, cavalry and solid auxilia; he has psiloi and fast auxilia on the other hill. Clearly the Numidians were not keen on fighting each other, as there were a number of rounds of combat that saw no casualties on that wing; the Romans were not so delicate in their attitude to each other. This is my first victory with this Marian BBDBA army. I’m still not sure how to get it to work well. 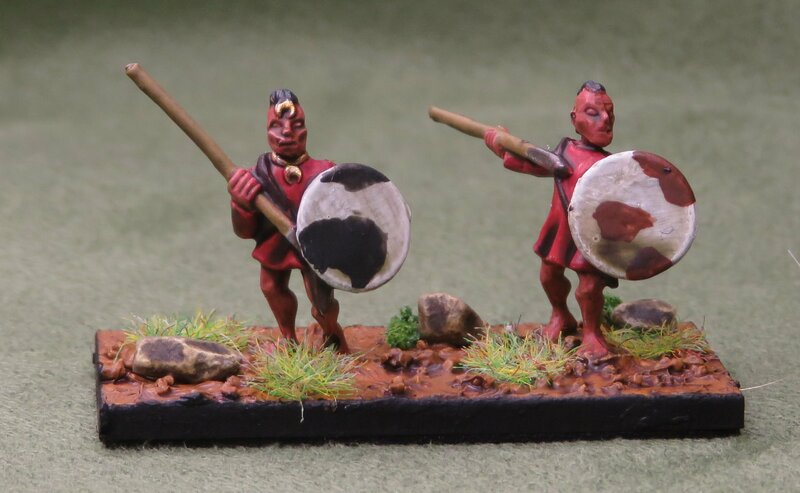 I will probably get my Carthaginians out as a BBDBA army again soon. They are similarly winless, but I now have a better idea of how to organise commands. The Numidians are now compliant with DBA 3.0. I have been very disciplined this year and only bought one pack of figures (I saw them on TradeMe). 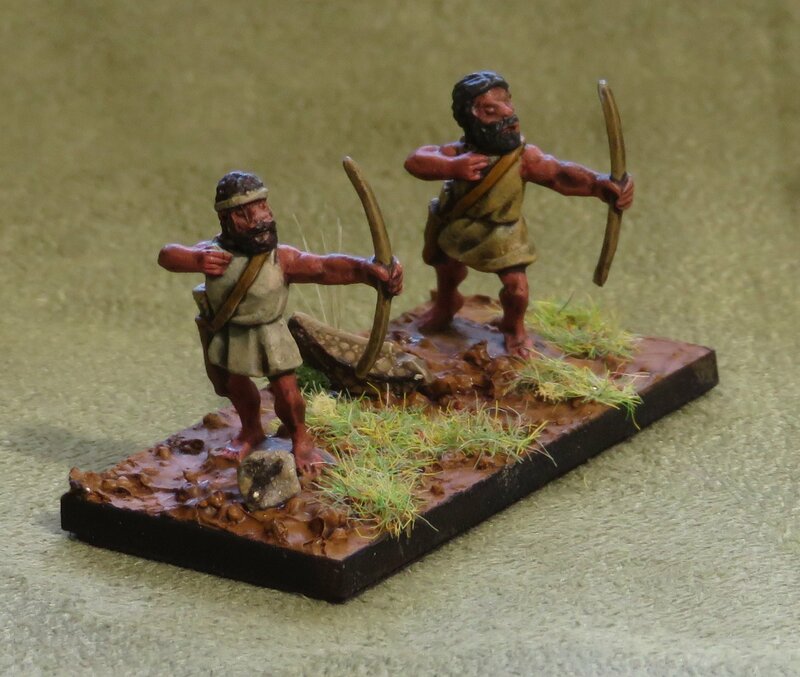 They were Corvus Belli Numidian archers. I can now have my fifth Ps as archers instead of javelinmen. Painting this element is an excuse to update the page, and to take the photos again with a better camera. The camp (a mixture of Old Glory and Freikorp figures, as well as Donningtons and Essex, I think. 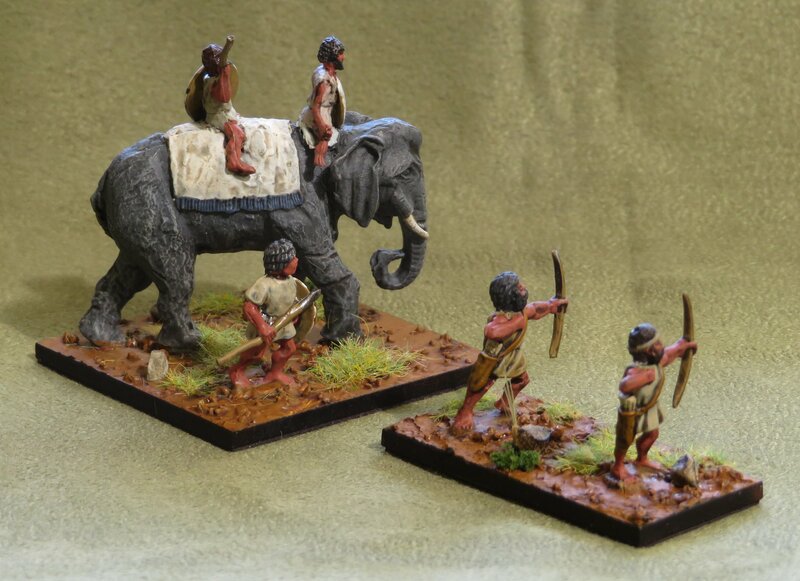 An elephant or some archers. The archers, for full DBA 3.0 compliance. 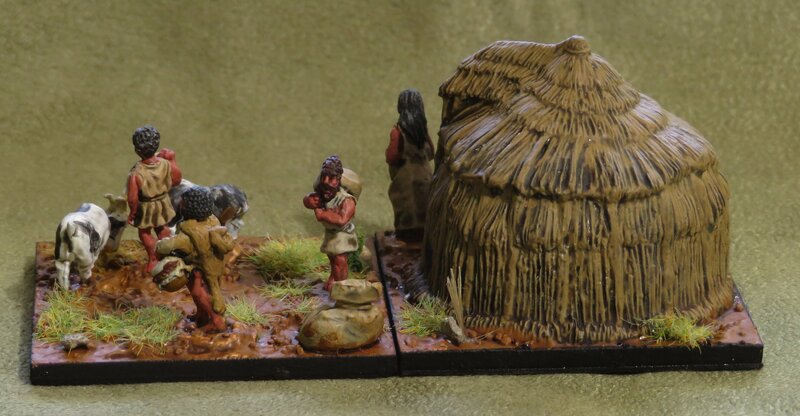 I delved into my lead pile and extracted some figures I bought a good while ago and finally put some paint on them. They had always been an army that shouldn’t have been too much trouble, as they are mostly light horse and psiloi, so few figures, and those not having a lot of variety to their clothes either. The army was originally intended to be used in a Punic Wars campaign. It’s been finished with a view to being used as an ally to a Marian Roman army. Despite the Corvus Belli figures no longer being made, I am fortunate to be able to field the main options for the army, even with the changes to the list under DBA 3.0. The heart of the army is its cavalry. I have gone for the Cv general over the LH one. the LH one is probably a better choice for the earlier versions of the army. Otherwise, the army is able to field up to 6 LH and an elephant. The cavalry commander and the elephant. The famous Numidian light horse; you can see two of these were painted some time ago for the Carthaginian army. The rest of the army is now mostly psiloi; under DBA 2.2 these could have been 3Ax, which would be more useful. I’ve only painted the minimum of four Ps, though I have stacks left, as I’d anticipated basing some of them as 3Ax. 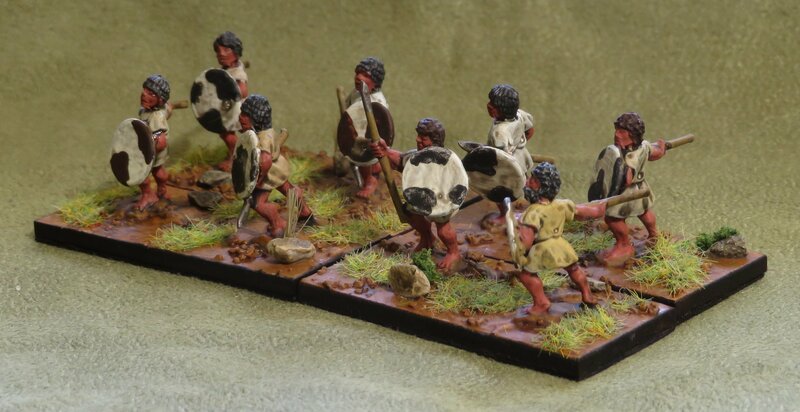 What would be good, would be some of the CB Numidian Warriors III (CB408) to use as Imitation Legionaries or Roman-trained regular javelinmen. 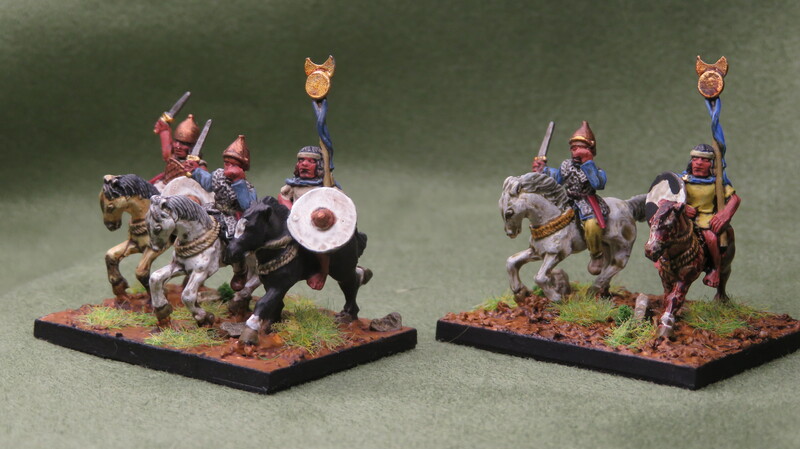 In their absence I’ll be using Freikorp Imitation Legionaries I’ve already painted. The not so famous Numidian foot, now all psiloi or a couple of imitation legionaries (on loan from the Seleucids). 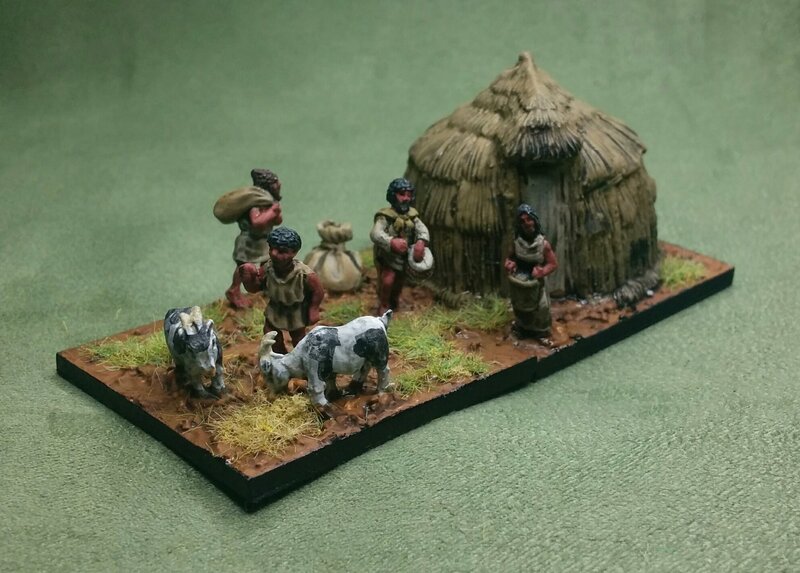 I’ve also done a camp using a Baueda hut and figures from Donningtons and Freikorp. I’m not overwhelmed by the quality of the paintjob; I’m rusty and I was in a hurry to get them done. The wash was a bit rushed, which is something I’ll be more careful about in the future. 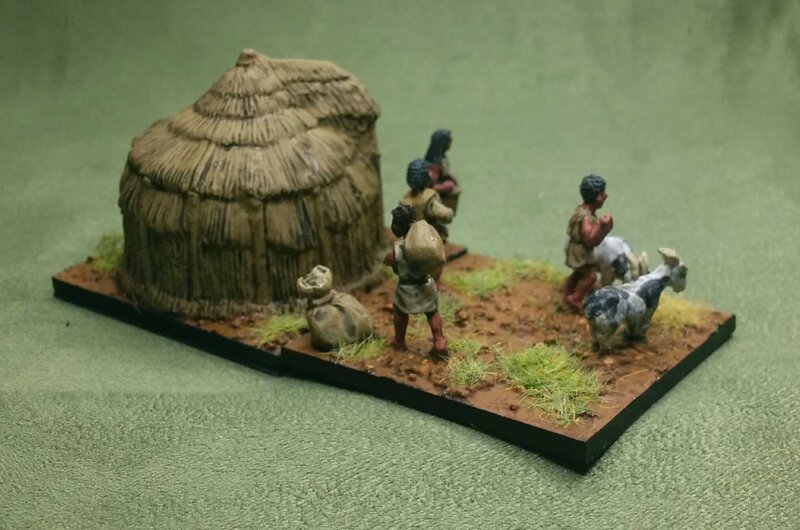 I should add some stones and reeds to the bases at some stage too. I have started using a wet palate, which has made painting faster and easier. 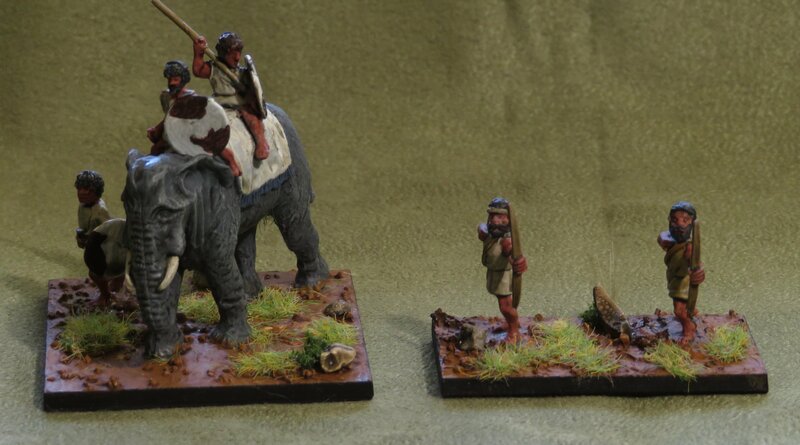 I did two more elephants, so that I can field a BBDBA Marian Roman army with lots of elephants. 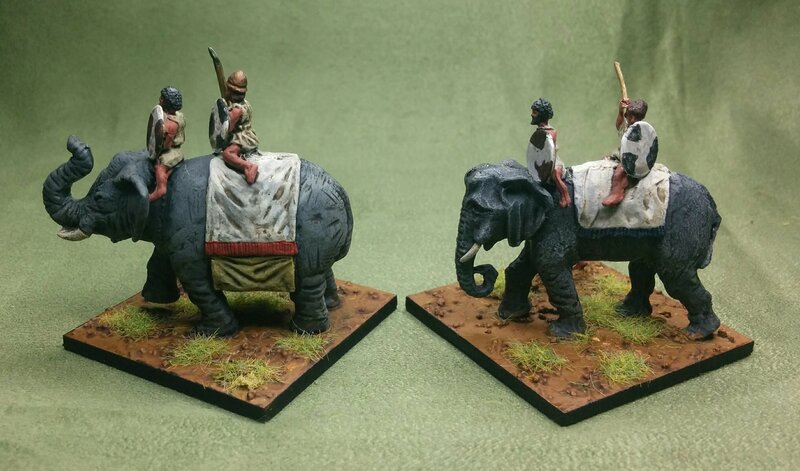 I was surprised to realise the elephants were smaller than the Carthaginian one I used for the Numidian army, but it’s less noticable when they’re on the field. 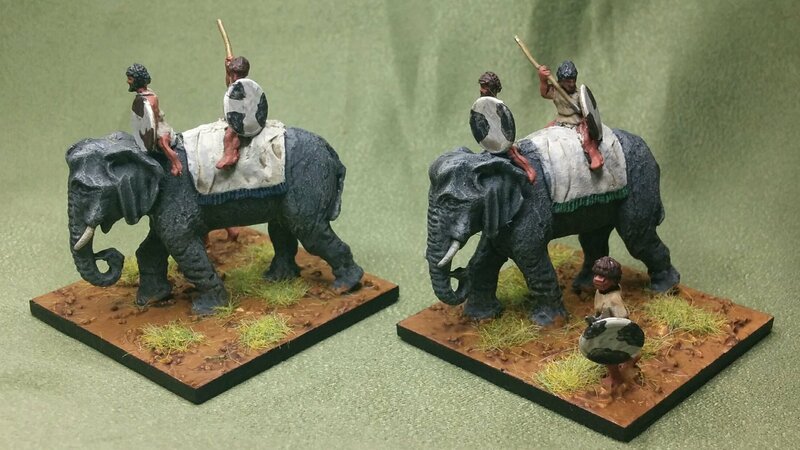 More Numidian elephants for the Romans to use. A blurry view of the other side. One of them needed a bit of greenstuff to repair his trunk and tail! The moulding was a little poor overall; the feet of the two crew are a bit runty and the mahouts have no goads, which may be moulding or design. The javelins are ridiculously skinny and have broken already once. I’m not sure what their longevity will be. Big elephant, little elephant. I replaced the shields on all of them to make them match the Corvus Belli figures more. Side on. The left one is the Freikorp Carthaginian, the right is Numidian. Last Friday Nick and I tried a game of BBDBA. 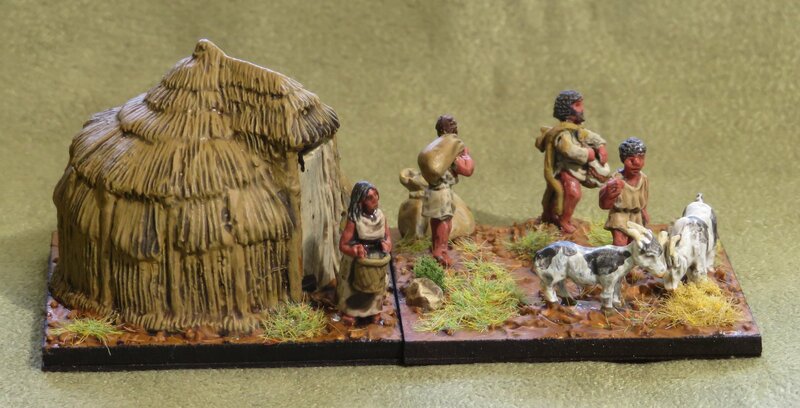 I’d got my Numidians finished and could field a Marian army, albeit with a few of the elements not as I’d want them. Nick put together another Marian army, not with any prior preparation. I was the defender and set up all my commands, followed by Nick. I then rolled 7 total for my PIPs, so made the ploughed rough; not what I’d expected! The perfidious Caesarians arrayed with their lickspittle lackeys in support; the left command has Spanish auxiliaries, elephants cavalry; the centre command consists of a block of legionaries and a line of them; the right has legionaries and cavalry. My plan was to win in the centre and hold on the flanks. I gave my high dice to the centre. The Numidian flank was hampered by the ploughed fields. The glorious defenders of the republic. 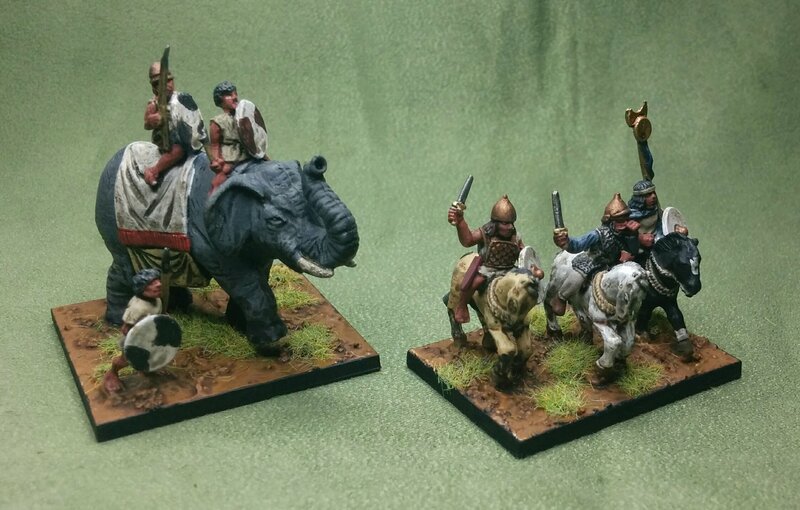 On the left is the loyal Juba with his elephants, imitation legionaries and Numidians; the centre is Scipio with elephants, legionaries and Spanish auxiliaries; the right has a few legionaries, Spanish auxiliaries and Gallic cavalry, commanded by Labienus. My initial PIPs were very low, and I was anxious about trying to get my light troops across on my left to intercept the elephants. Nick had his high PIP dice there. I seemed to forget about holding on the flanks, and although I got one of the elephants, that command broke. There was a stalemate across the ploughed field on the right and I actually did win in the centre, where Nick was using some of his legionaries to break my left flank. 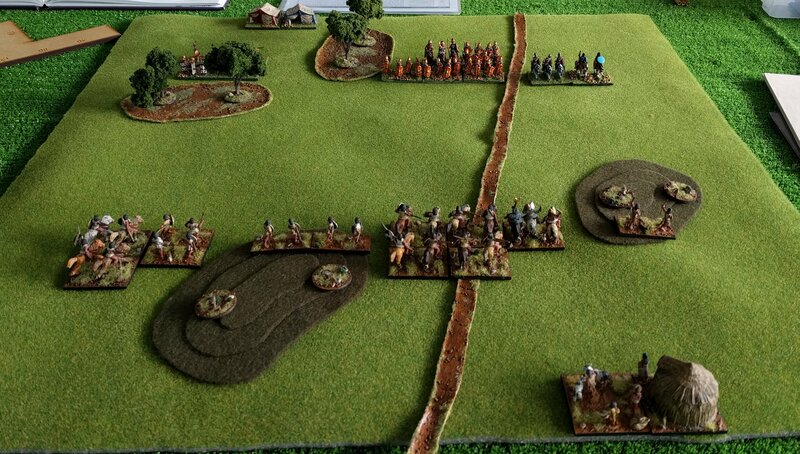 However, I’d lost patience, and forgotten the plan, and attacked on the right flank. It didn’t go well. The game took some time and was very close, in that I was close to breaking, but could have won if I’d hadn’t been so rash with the Numidians. In the end Nick broke the Numidians and won the battle. It was a fun game and I learnt a good deal about BBDBA. We’ll have another game soon; I may have to rethink my commands; the centre could have used a more mobile reserve, but then the left flank would be less effective, possibly. Food for thought! What got me thinking of fielding a Marian Roman army for BBDBA was reading Allan Massie’s novel Caesar. It’s narrated by Decimus Brutus, one of Caesar’s lieutenants and one of the conspirators. It examines the motives of the aristocracy in that period sensitively and intelligently. I particularly liked the way Massie described Decimus Brutus’ changing opinion of the choices Labienus made. Initially he’s derided as an overprincipalled clown, but later as the necessity for assassination grows in Brutus’ mind he is sympathetic to Labienus; there is also a fictional letter to Brutus from Labienus explaining why he supported Pompey, recognising him as the lesser of two evils and one that he thought he might be able to control better. I’d like to read the rest of Massie’s novels on the figures of this period — Mark Antony, Augustus, Tiberius, Caligula, and Nero’s Heirs, but I can’t get the books from Google Play to my Nook; until I can I won’t buy more. Instead I’ve been finishing Robert Harris’ series narrated by Cicero’s slave then freedman, Tiro. I’ve finished the first two books, Imperium and Lustrum (or Conspirata) and am just starting on the last Dictator. The portrayal of Cicero is believable, and his take on Caesar is one that I agree with. Anyway, it was while reading Massie that I thought that I could happily field an army led by either the Republican resistance to Caesar, or the Liberators who delivered extrajudicial justice to the tyrant. 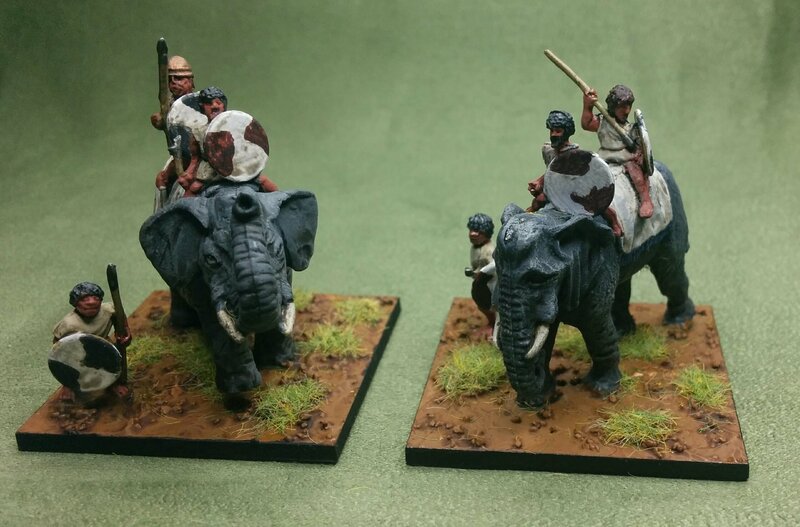 The Thapsus army has the advantage of allowing a Numidian ally and lots of elephants to bolster the Roman blade against opponents with knights. 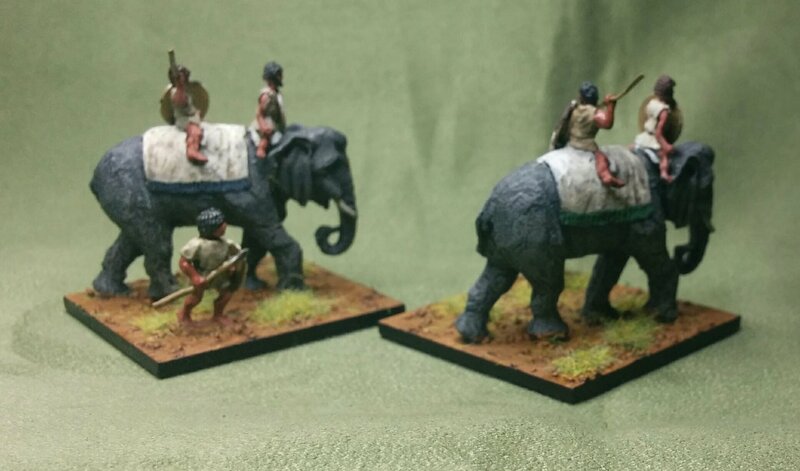 I’ve had the Numidians waiting to be painted for a while, and I had a Freikorps Carthaginian elephant that has a Numidian mahout; I’ll get two more for the maximum pachydermal goodness. 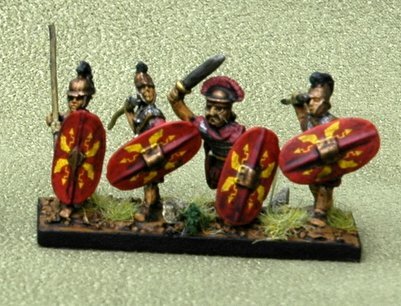 I was pleased to read in the continuation of Caesar’s Civil War commentaries that Labienus had Gallic cavalry with him at Thapsus, so that’s an incentive to get more of my Gallic cavalry painted to enable Labienus to restore the Republic to its former virtue, guided by the moral vision of Cato the Younger. The Republican army at Thapsus led by Scipio and Labienus and aided by their ally the Numidian Juba. 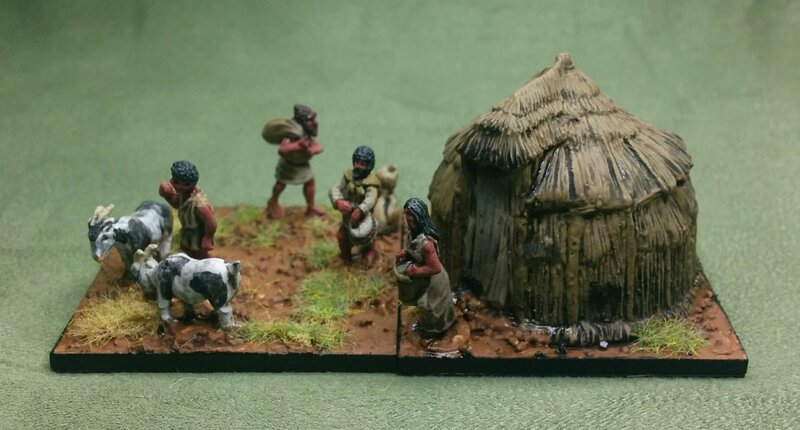 I’m painting the Numidians now, and I’m looking at rebasing Spanish to make enough 4Ax. Otherwise, I’m pretty much able to field this army. I would look to get a few more elephants, though. I’m not normally a big fan of Roman armies, but the any that resisted the tyrant Caesar is OK, especially with honourable leaders such as Labienus and Cato the Younger. Another army is a Mithridatic one with an Armenian ally. I’d need to paint a bit more to get this one ready. It’d have two solid wings of light horse and auxilia, a centre of blade or pike and enough knights to be a threat. I could also put together a Syracusan army with a Carthaginian ally. 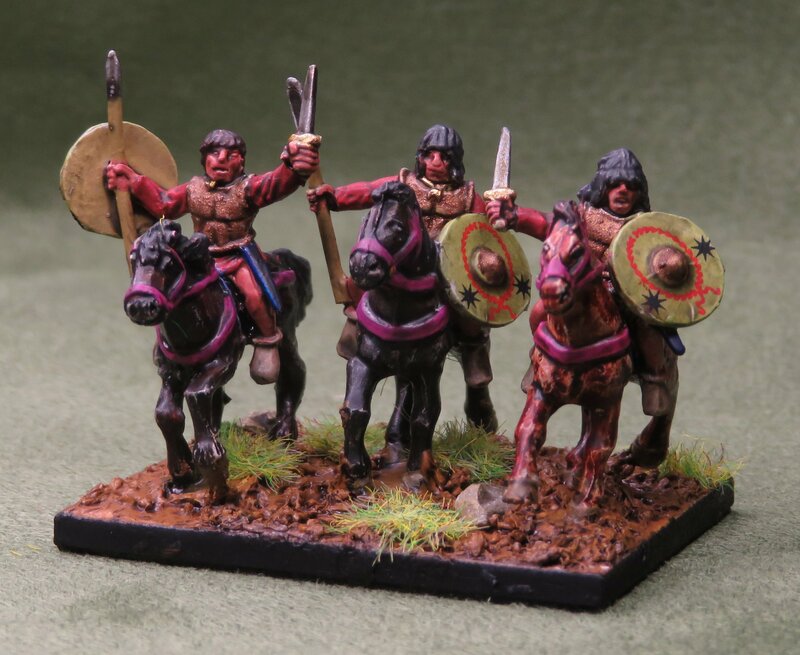 Anyway, along with getting these armies ready, I’m reluctantly planning to rebase my Gauls as 4Wb; I’m hoping I can get some rather nice looking Xyston Gallic foot nobles to mix in with the Corvus Belli ones to add some further presence to each element. 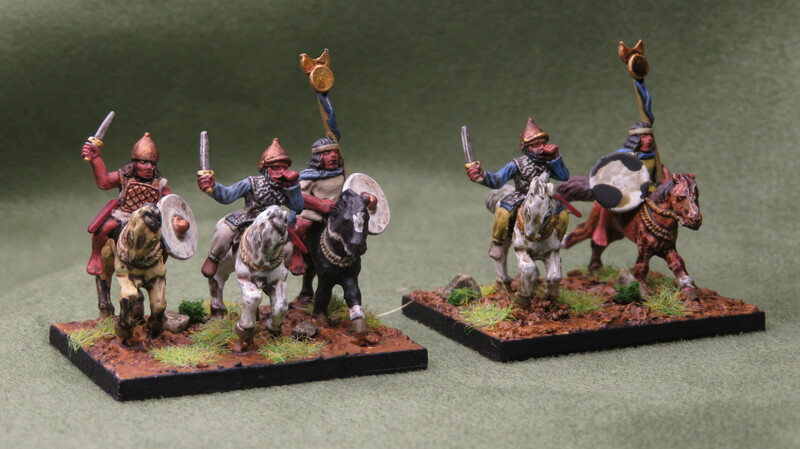 I also have plenty of Gallic cavalry to look at painting. Perhaps they could be another BBDBA army!